Expanding power transmission and distribution network, plans to improve national electrification rate along with ambitious infrastructure projects to boost the economy are some of the key factors responsible for the growth of switchgear market in Indonesia. Further, Government initiatives like the One Million Houses Programme and 35 GW Power Programme are also expected to drive the growth of Indonesian switchgear market during the forecast period. According to 6Wresearch, Indonesian switchgear market is projected to reach $317.3 Million by 2023. According to the National Energy Policy 2014, Dewan Eenrgi Nasional (DEN) plans to increase the share of new and renewable energy sources in the national energy mix to at least 23% by 2025. The same is stated in Electricity Supply Business Plan (RUPTL 2016). The overall switchgear market is dominated by low voltage segment. In the medium voltage segment, AIS has the majority revenue share while GIS is anticipated to gain market share in the future. The region of Java had the largest market share in-terms of revenues in 2016. During 2017-23, the regions of Java and Sumatra are expected to maintain their dominance in market as a large number of real estate projects are either under construction or in planning stage in these regions. 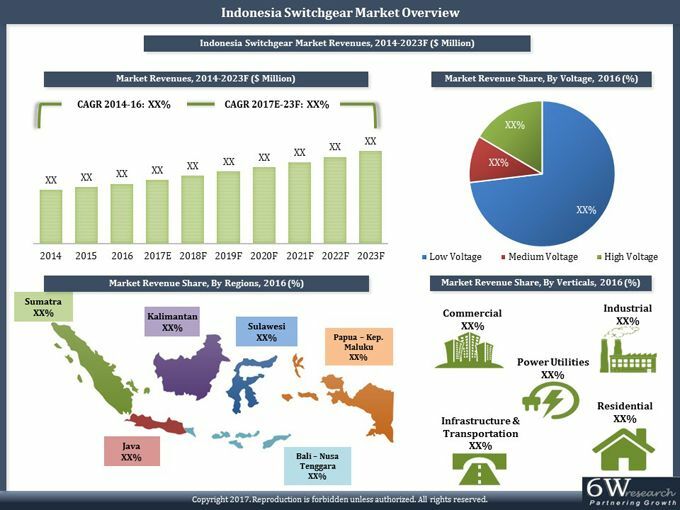 The report comprehensively covers the Indonesian Switchgear Market by voltage, insulation, types, verticals and regions. The report provides an unbiased and detailed analysis of the on-going trends, opportunities/high growth areas, market drivers which would help the stakeholders to device and align their market strategies according to the current and future market dynamics.